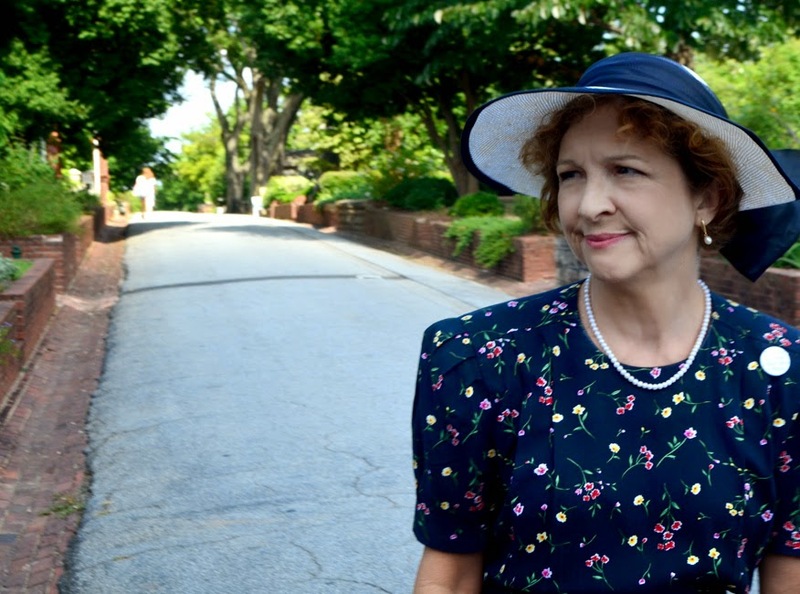 wanderlust ATLANTA: Sally Smith is "Margaret Mitchell"
It's my honor and with gratitude that I have the great pleasure of introducing Sally Smith, the personality behind "Margaret Mitchell" of Atlanta Movie Tours. Sally will grace the stage of The Fox Theatre this coming weekend to introduce two showings of Gone With the Wind, part of the 2014 Coca-Cola Summer Film Festival. A few days ago, Sally and I dined and talked for 3.5 hours at Livingston Restaurant + Bar in the Georgian Terrace, which of course has a significant role in Margaret Mitchell's and Gone With the Wind's histories. I'd like to frame this writing around a recent "Margaret Mitchell's Gone With the Wind Tour", through Atlanta Movie Tours. Sally was of course Margaret, it was my second time enjoying the tour, but my best friend Barry's first time—I was sure he would like Sally AND the tour. And that he did! It was great to see him fascinated and laughing so much. 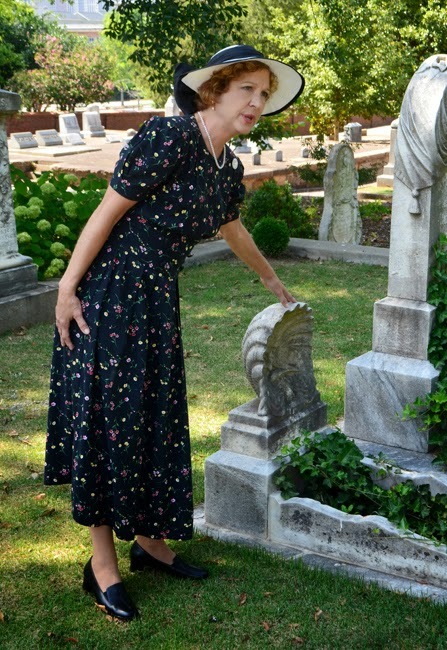 Photo: Sally Smith as "Margaret Mitchell" at Oakland Cemetery, where Sally works and volunteers, when she's not giving tours for Atlanta Movie Tours. Many "Windies"—uber fans of Gone With the Wind—know that Margaret Mitchell wrote the final chapter of her novel first. Ironically, I decided that I want to do the same in introducing you to Sally. The most important thing I learned about her was in her answer to the final question I posed, and it's the one thing that will likely define her for all of her days. Sally arrived at the Georgian Terrace as Sally Smith. I'd only seen her as "Margaret Mitchell", but there was no mistaking that smile. And I quickly noticed she was wearing the button that she wears on her tours, one that reads, "Frankly my dear, I don't give a damn." That totally speaks to Sally's wonderful sense of humor, but mind you, she's incredibly sensitive to her audience and wholly respectful. wanderlust ATLANTA: What message or sentiment, that you share with Margaret Mitchell, would you like to share with your fans? Sally: "I'd love to share one of Peggy's mottoes—Peggy was the name Margaret adopted when she went off to college—one that I share with her... 'Never give up'. 'Never give up on yourself or life'. There are certain things one should give up, of course, like toxic relationships, but stay the course. The storms don't last forever." Sally went on to say, "Life has too much to offer to give up. Of course you have to take the bad with the good, but you have to make the best of the bad." As soon as Sally mentioned Auntie Mame, we quoted in unison, "Live, live, live! Life's a banquet and most poor suckers are starving to death!" [Laughter...smiles...mutual understanding.] "Life is out there, you just have to get up off the sofa and be a part of it!" Sally is full of life...she's living life! That's one of the things I adore and admire about her. 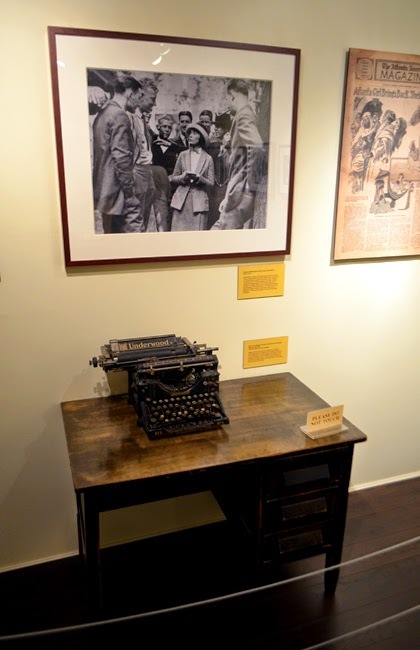 Photo: One of the desks on display at the Margaret Mitchell House, the one pictured above, is the actual desk that Margaret worked on while employed with the Atlanta Journal. She went by the pen name "Peggy Mitchell" while working there. The cool thing about the desk is that at a mere 4' 11" tall, the standard desk was considerably too high for Margaret, so they had to cut the legs down on this one to accommodate her stature. You can see in the photo above the desk just how diminutive she was in height, however she made up for it in personality. wanderlust ATLANTA: You are fascinating! Please share with us some of your background. Where are you from? Where have you worked? What do you do for fun? Sally: "I was born in the same hospital as Margaret Mitchell, St. Joseph's Infirmary. Today it's St. Joseph's Hospital, part of Emory Healthcare, and I was raised right here in Atlanta." "I went to school at Woodward Academy and then went on to earn a Bachelors Degree in Agricultural Economics at the University of Georgia. I retired from Fulton County government after 30 years. Like Margaret, I didn't work for the sake of making a career, I just wanted to be independent." "Chasing that independence was difficult for Margaret. She was born into a world where a woman stayed home and cared for her family. That she went to college and took a job at the Atlanta Journal as a reporter was unheard of at the time. She struggled with her 'role' as a woman. Margaret lived in a very different Atlanta." "Today I manage the Visitors Center at Oakland Cemetery, where I still give tours. I'm the president of Fulton County Retirees Association and of course I'm "Margaret Mitchell" for Atlanta Movie Tours. Yes, I'm a busy woman!" "You asked me about hobbies. I go to yoga practically every day...I miss it when I don't. I love reading and gardening. Oh, and I'm going to see Aretha Franklin at The Fox Theatre! And I remember seeing Tina Turner in Atlanta when it was 'Ike & Tina'!" Sally wouldn't admit it, but it was shared with me by another source that at Sally's retirement party, Fulton County made an official Proclamation—"Sally Smith Appreciation Day"—well deserved after 30 years of dedicated service. "Sally Smith is an exemplary public servant who is known among her colleagues for her dedication, knowledge, kindness, sense of humor, and willingness to help." The Proclamation goes on and on, and for the short time I've known Sally, I see all of those things to be wonderfully true. Photo: There are several areas within the Margaret Mitchell House complex where visitors can view exhibits that include original artifacts, photography and video, as well as the apartment where she and husband John Marsh lived when she wrote Gone With the Wind. The above photo includes the portrait of Scarlett O'Hara used in the movie. wanderlust ATLANTA: Margaret Mitchell was a deeply private person, yet did so much for the community at large, volunteering in the public eye. But much of her most impactful philanthropy was anonymous. You're a volunteer, too. Why is volunteering important to you? Sally: "When I retired I knew that I wanted to keep busy. My love of gardening drew me to Oakland Cemetery—it's a garden cemetery. Volunteering was so much more than I expected; I didn't realize how rewarding it would be." "It opened me up to the world of Hospitality in Atlanta, I met a whole new group of Atlantans, and I was all of a sudden meeting people from all over the world! I recommend it for anyone. You know, if you want to make a difference in the world, volunteering is a great way to do it." Photo: "In her personification of Margaret Mitchell, Sally captivates and immerses her audience in 'Peggy' Mitchell's Atlanta with the mellifluous ooze of charm expected of a Southern debutante, and the hilarious tongue-in-cheek humor of a rebel. You will either be on the edge of your seat hanging on every word or rolling in laughter," said Barry Holland, pictured above with Sally having fun at the Margaret Mitchell House. wanderlust ATLANTA: I've had the honor and privilege of meeting and talking with you several times now. I, personally, see distinct Margaret Mitchell qualities in you. What qualities do you feel you most personify in Ms. Mitchell? Sally: "When you look at life, on a global scale, we're on top. We have life pretty good. But, as we know in looking at Margaret's life, 'Life can change in an instant'." That sentiment was a common thread in our discussion throughout the evening. "My life has changed, more than once, and I've kept on going. Margaret never let anything stop her...not being blackballed by the Junior League, not being roadblocked by the male-dominated journalism industry, and not sustaining a debilitating injury...she kept on going! You have to admire her for that!" "I love to read and of course Margaret was an avid reader. It's said that she devoured the local library. Well, everything except for the reference section, as the story goes. My son reads a lot, too." "Margaret wanted to be a travel reporter before she landed at the Atlanta Journal. Me? I'm still trying to figure out what I want to be when I grow up." Photo: Central Library in Downtown Atlanta, across from Margaret Mitchell Square and the Georgia Pacific Tower, which stands where the Loew's Grand Theatre once stood—the theatre where Gone With the Wind premiered in 1939. 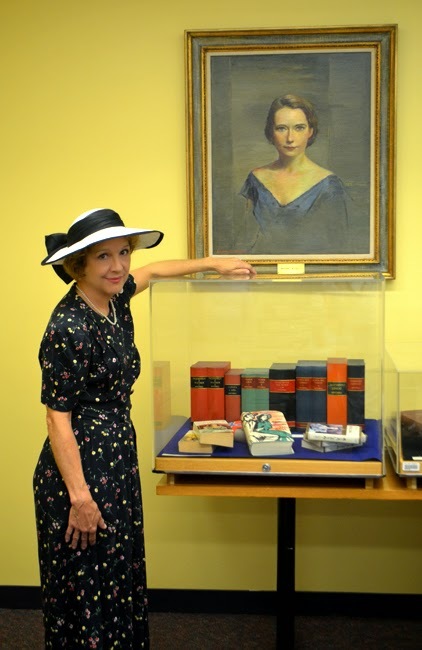 The Library has a fascinating collection of Margaret Mitchell and Gone With the Wind memorabilia, including the one millionth copy of the novel and Margaret's library card. wanderlust ATLANTA: What about Atlanta Movie Tours have you enjoyed most so far? Sally: "That they like me so much." [Laughter] "Like Margaret's mother told her, 'Life can change in an instant.' That's pretty much what happened with Atlanta Movie Tours. I'd been working at Oakland Cemetery and every Halloween they host tours led by different personalities whose final resting place is there. One year I portrayed "Margaret Mitchell". "When Patti and Carrie—the owners of Atlanta Movie Tours—approached Oakland about it being a stop on their new "Gone With the Wind Tour", my colleague asked who was leading the tour. They named a few personalities, but not Margaret. She suggested to them that she knew someone they might consider. I later found myself at lunch with Patti and Carrie, which turned out to be sort of an interview." "When they asked, I said to myself, 'I'd be crazy not to try it.' And the rest is history, so to speak." Photo: There were many Gone With the Wind premier events hosted at the Georgian Terrace, where the main actors stayed during the premier activities. The menu in the photo above—on display at Central Library—is from The Main Dining Room at The Georgian Terrace. The most expensive entree offered was "Filet Mignon with Green Peas and Asparagus Tips" for $2.25. 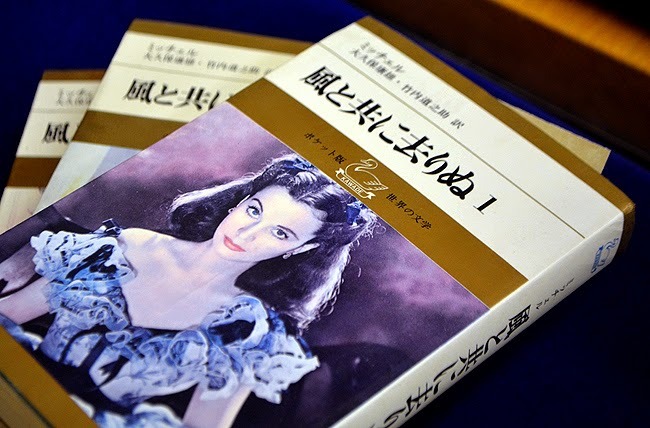 For dessert, an "Ice Cream Mold 'Gone With the Wind' Open Book" was an offering. Our 3.5 hour dinner and discussion took place at Livingston Restaurant + Bar, in The Georgian Terrace Hotel—the restaurant was originally the hotel lobby! We had a Peachtree Street window seat with a splendid view of The Fox Theatre, where Sally will introduce the film Gone With the Wind this coming weekend. The staff and management treated Sally and I like VIPs...they were wonderful! The hostess was pleasant and kindly accommodating. I wanted a window seat, that also had access to electricity—for the laptop, which I ended up not using. Sally is so captivating, writing notes made it much easier to enjoy the process of getting to know her better. Justin was our server and provided superb service. We never wanted for anything! We both enjoyed a cold beverage and began with an assortment of appetizers. The Fried Green Tomatoes—delish, the Cauliflower Popcorn—a brilliant interpretation, and the Crispy Smoked Chicken Thighs with fresh sliced apple and red cabbage slaw in a blue cheese vinaigrette—amazing...I could eat those all day! Ashley Dulgarian, Business Development Manager at Livingston, stopped by our table and bid us a delightfully charming welcome! She shared some Georgian Terrace history with us, and us with her, and she bestowed upon Sally good wishes for her Fox debut. She later brought us both a souvenir book of Georgian Terrace history—I can hardly wait to get into that one! Later we were surprised again when Justin stopped by with two glasses of champagne and a virtual dessert buffet! Ashley had arranged for us to be treated. We enjoyed Carrot Cake "Twinkies" and a flight of ice cream that included the flavors of white peach, blood orange, and pomegranate—the latter being my favorite. Wow! What a wonderful treat. The Livingston staff and the deliciousness and presentation of the food that evening just reinforced all the more that it's my favorite Atlanta restaurant. And I've been saying that since long before they ever heard of me. 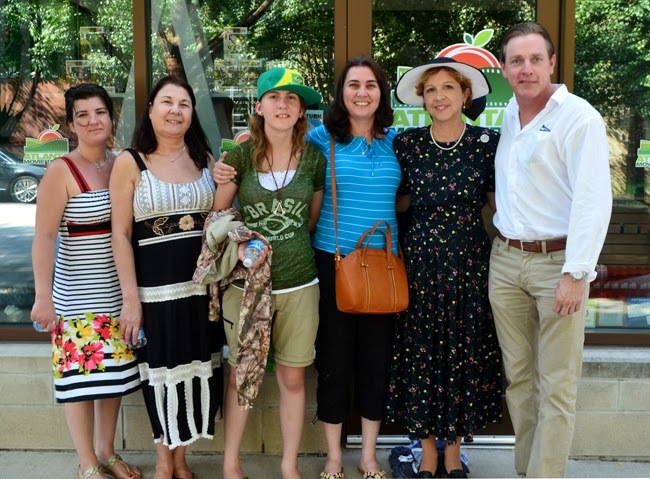 Our experience at Livingston was the epitome of Southern Hospitality and I'm thrilled that they were so kind to Sally. 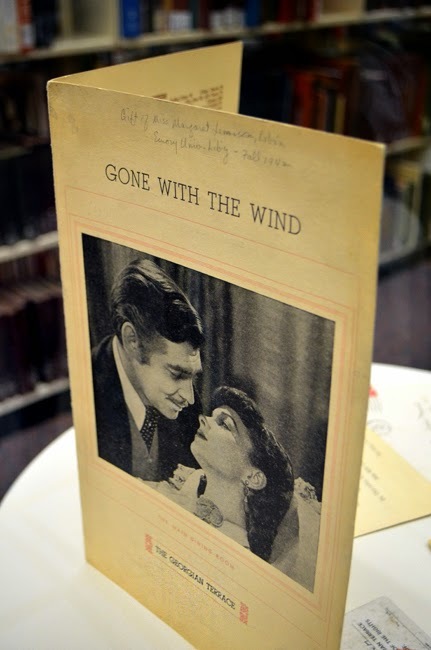 Photo: Part of the Central Library collection includes a wide array of foreign language editions of Gone With the Wind, as well as part of Margaret's reference library that she used when writing Gone With the Wind. wanderlust ATLANTA: You will soon be on the stage of The Fabulous Fox Theatre! You give such a mesmerizing performance as "Margaret Mitchell" on the Gone With the Wind tours, I have to ask...do you have acting experience? Sally: "No, not really. Of course we had to take Public Speaking in college, but it wasn't until years later that I spoke in public. When I was the Greenhouse Manger for Fulton County—I worked in several departments over the 30 years—various garden clubs would invite me to speak at their meetings." "Well, the first one included a potluck dinner. Later when I got up to the podium, and I'd brought my husband, I started with, 'That's the best dinner my husband has had in ages!' The ladies laughed and laughed and I've been hooked on public speaking ever since." "I later adopted the philosophy that if you can't do anything about your situation, then laugh. We all have rough times, and laughter can be quite a powerful thing." Sally and I laughed a lot that evening. She has a wicked sense of humor, but with a generous dose of discretion. 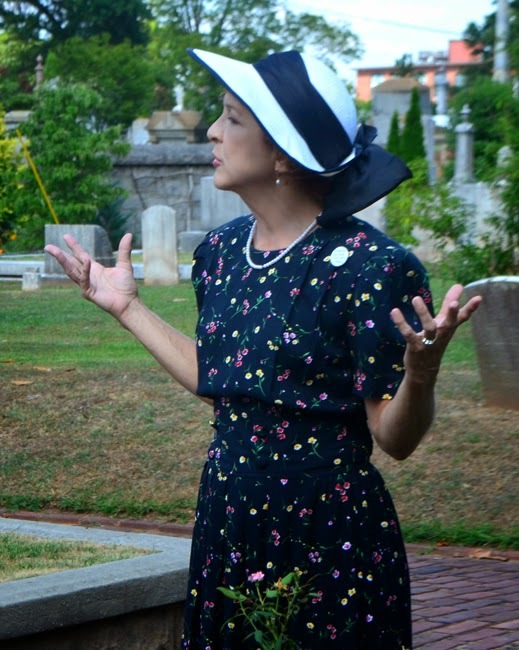 Photo: Sally, as "Margaret Mitchell" sharing with the tour group the symbolism of some of the grave stones and plot designs. On a personal note, Sally is one of those people that you can't help but to immediately admire—you've met those people in your own life—and I knew I wanted to get to know her from the onset. If I forget to thank her later for the amazing interview and for being so much fun, let me say it here. "Thank you, Sally! You're a wonderfully brilliant and inspiring human being. I'm so grateful and fortunate to know you." Photo: Sally as "Margaret Mitchell" sharing more about Margaret's family life with our tour group. Oakland Cemetery is also where we had our souvenir group photo made! wanderlust ATLANTA: I suspect you're a fan of Georgia tourism. In addition to Atlanta Movie Tours, Oakland Cemetery and the Margaret Mitchell House, are there other destinations on the "Sally's Must-See List"? Monastery of the Holy Spirit, to name a few. In Atlanta, I love to visit the Atlanta Botanical Garden [where I, Travis, am a docent, so I was thrilled it made the list!]. And although it's been a few years, I have fond memories of rafting on the Chattahoochee. If you didn't notice, I enjoy being outdoors and in gardens." Photo: This is part of our tour group. I made the photo back at Atlanta Movie Tours' offices. To the left is a Brazilian family—the two on the far left live in Sau Paulo and the other two currently live in Philadelphia. That's "Margaret Mitchell" (Sally Smith) in the hat and dress with Barry on the right. The other tourees had departed when I made this photo. It was a fun group! 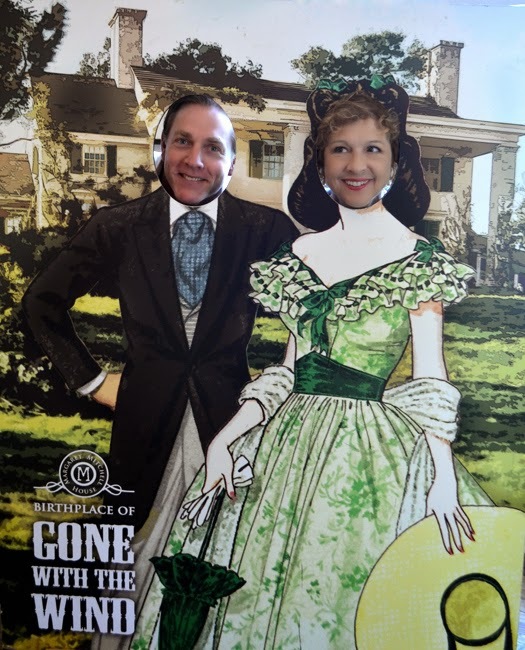 If you'd like to learn more about the Margaret Mitchell's Gone With the Wind Tour, please see my post, "Through the Eyes of Margaret Mitchell". Remember, Sally, as "Margaret Mitchell", will be introducing Gone With the Wind at The Fox Theatre this weekend—a celebration of the 75th anniversary of the movie. If you miss her then, you can experience Sally at Atlanta Movie Tours. 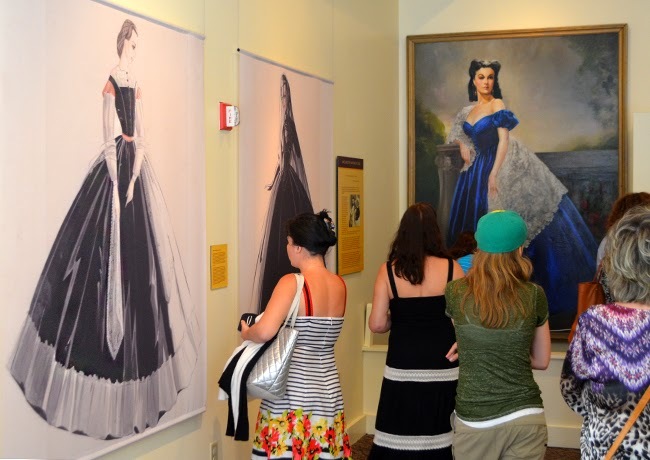 wanderlust ATLANTA: In your experience, how vast is the Margaret Mitchell and Gone With the Wind fandom? Why do you feel it’s so widespread? Sally: "The fandom is global, without a doubt! Margaret Mitchell was a student of the human condition. She observed people and had a keen sense for who they were. She understood that 'We're all human'. I think that's what people connect with in her writing. And I admire her for not changing after she became famous. She didn't change her lifestyle and being a celebrity wasn't all-important to her, but helping others was, as were her friends and 'living' life." What a wonderful, positively gorgeous article!! You revealed things about our darling Sally that even we didn't know. Thank you so much, Patti! We had a blast...and what a rich life Sally has led, and I suspect it only gets better and better. Looking forward to seeing everyone at the Fox this weekend!